I seem to be a little obsessed with hand pies these days! Following my previous post for a savory hand pie, I thought I’d follow up with a sweet option. The inspiration for this pie came from browsing the spice blends with Kristina at Stone Creek Kitchen. I had planned on doing a coconut pudding filling and was inspired to add a savory spice blend for a little extra kick. I used a curry mix, but I’m sure that a garam masala or STK’s Ancient Chinese Secret spice blend would work just as well. The filling for these pies makes a great pudding on its own–just serve with some fresh berries and a crispy cookie. In a medium sauce pan, bring milks just to a simmer over medium heat. Meanwhile, combine brown sugar, corn starch, salt and egg yolks in a large bowl and whisk to completely combine. Slowly whisk the hot milk into egg mixture. Return mixture to the sauce pan. Cook over medium-low heat, stirring constantly, until thickened. 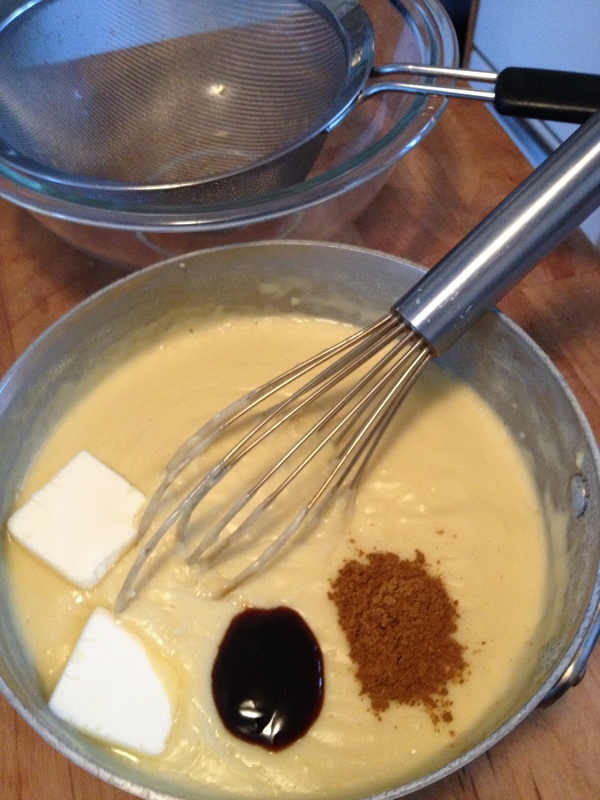 Whisk in butter, curry powder and vanilla. Spread coconut evenly on a small baking sheet. Toast in oven for 5-7 minutes or until evenly browned. Watch carefully, as coconut burns quickly. Peel banana. Cut in half and slice into ¼” half moons. Melt butter and brown sugar in a non-stick sauté pan over medium heat. 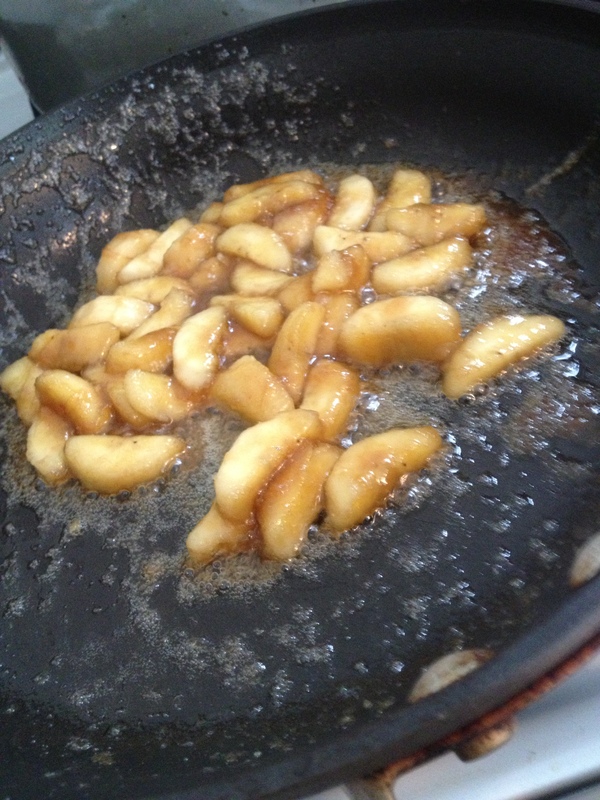 Add bananas and cook until nicely caramelized—about 5 minutes. Fold toasted coconut and caramelized bananas into filling. Combine flour, coconut, sugar and salt in a medium mixing bowl. Add shortening and cut into the flour mixture with two knives, a pastry blender or your fingertips until the mix resemble a course meal—kind of like wet sand. Whisk together egg, water and vinegar and add to flour mixture. Combine with a fork until a rough ball begins to form. Pull dough out onto a lightly floured board or clean counter and turn and push mixture together a few times to form a cohesive ball. Flatten into a disk and wrap in waxed paper and refrigerate for 30 minutes or more. 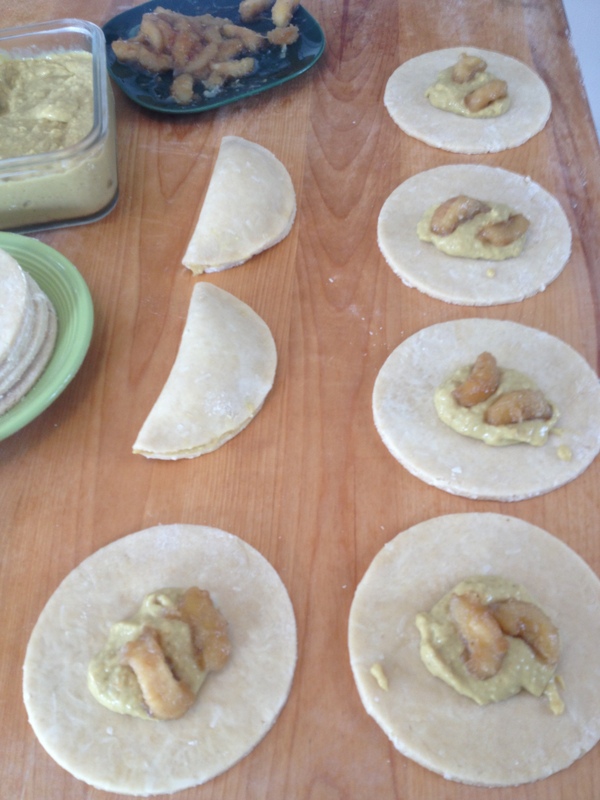 Cut dough in half and roll half out to ⅛” thickness on a lightly floured board. Cut out 5” circles and set aside. Roll up scraps and set aside. Roll out second half of dough in the same manner. Gather up all scraps and roll out one last batch. You should have 12 circles. Working in batches of 4 or 6 circles (depending on space), place about a tablespoon of filling in the center of each circle. Wipe the edges of the dough with a finger dipped in water. Fold edges together and pinch with thumb and index finger. Crimp edges with a fork. If fork sticks to dough, dip it in a little flour. Place oil in a heavy bottomed pan with sides at least 3” high to a depth of about 1 ½”. Heat over medium heat to a temperature of about 350°. 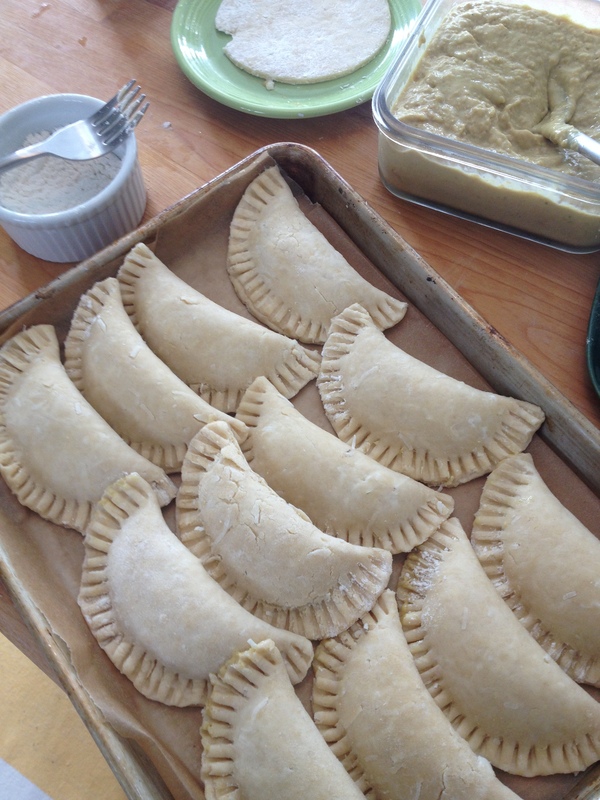 Fry pies, two or three at a time, for about 2 minutes on each side until lightly browned. Drain on a rack over a sheet pan. These pies taste best if eaten within a day. Using pre-made frozen pie crust is an acceptable shortcut. Components can be made a day or two ahead and assembled and fried when ready. 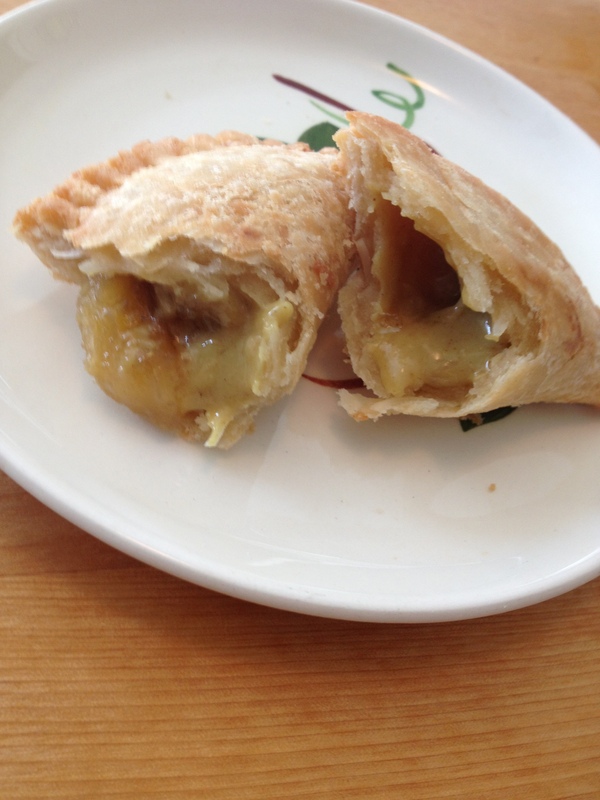 Posted on May 16, 2013, in comfort food, dessert, recipes and tagged coconut, curry, dessert, hand pies, pie, spice. Bookmark the permalink. 4 Comments. Coconut and curry? You are speaking my love language. This flavor combo was even better than I imagined, Ronne. I have a horrible fear of frying. I wish you were in Texas to coach me. Can I bake them? Why not give it a try? 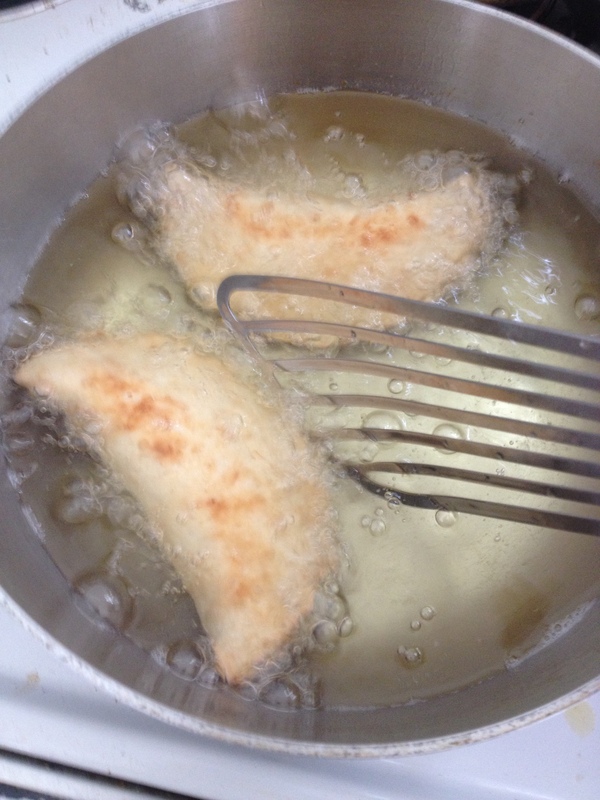 I fried them because I was afraid that baking might overcook the filling…and, oh yeah, because I liked fried things!